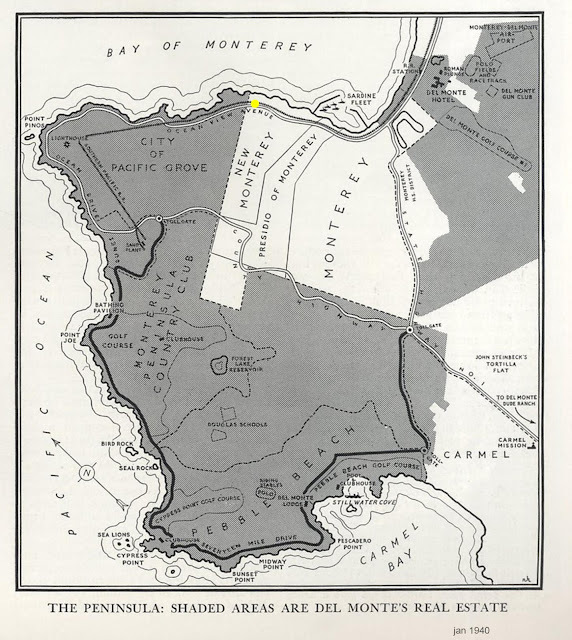 Here is a detailed map of the Monterey Peninsula from the January 1940 edition of Fortune magazine. The shaded areas show the real estate owned by the Hotel Del Monte (which was at the start of the 17 mile drive which fanously leads to Pebble Beach golf course). It indicates the location of John Steinbecks Tortilla Flat (published 1935 - see HERE) and Oceanview Avenue, site of the Sardine canneries and later re-named Cannery Row - subject of a later Steinbeck novella Cannery Row (published in 1945 - see HERE). I had added a yellow dot at the approximate location of Ed Ricketts lab which was sited on Oceanview Avenue.